House Of Tsang Gift Set #Giveaway CLOSED! In my home, we love to cook and when we cook we cook dishes from all over the world. One of my personal favorite cuisines is Asian. My husband was in the Marines and he spent some time in the Asian countries, during his time there he learned how to cook quite a few Asian dishes. When we decide to make a Asian dish for dinner, we will usually go to the local Asian market so we can get those authentic spices and flavors. The thing is, it would be so much easier if we were able to get the sauces to cook with at our local grocery store instead of driving across town for what we need. I guess I really did not think of using the products that we can find at our store, that is until I was sent some of the House of Tsang sauces to review. I was unaware that Hormel made a line of Asian sauces and oils, and to my surprise they are amazing! The Chinese New Year was on January 23 of this year, and we were able to celebrate the new year by cooking some amazing Asian dishes with the sauces we got from House of Tsang. 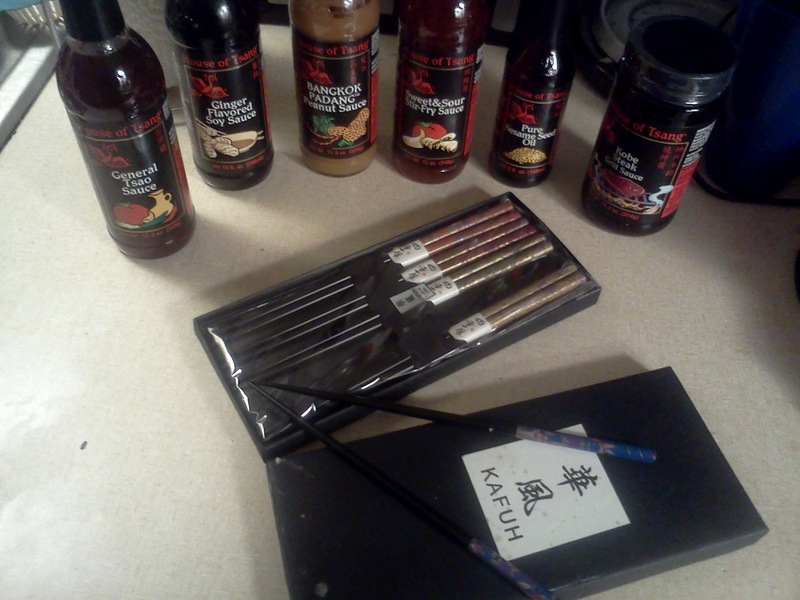 On top of the sauces we were sent, we were also sent a great set of chopsticks that were perfect for our celebration! For dinner on the night of the Chinese New Year, I chose to go with my own personal favorite dish, General Tsao’s Chicken! OMG!! The General Tsao Sauce that came in the House of Tsang set that we got was just amazing. After my husband cooked the rice and chicken, he then mixed the sauce in with the chicken, and the flavor was everything I look for in a good General Tsao’s Chicken dish!!! The other sauces that came with the set have also been great, I love the tastes and the fact that all of the spice for each sauce is already in the mix, so all we need to add is the meats and vegetables!! Well the wonderful people from House of Tsang would like to give one of my amazing readers the same set they sent me!! Like House of Tsang on Facebook and tell them which Asian dish is your favorite! Please leave me your email with this entry!!! This giveaway is open to US residents. This giveaway will end at 11:59 pm on March 7,2012. Winner will be chosen at random.org and will be given 48 hours before another winner will be chosen. All products for reviews and giveaways are given as a sample from the companies. All opinions in reviews I conduct are my own. I was not paid to say anything or review any products. Next Post Wordless Wednesday…I Got A Peanut! !